NOT ‘HAT,’ WHAT’S UNDER THE HAT ON THE ROCK. 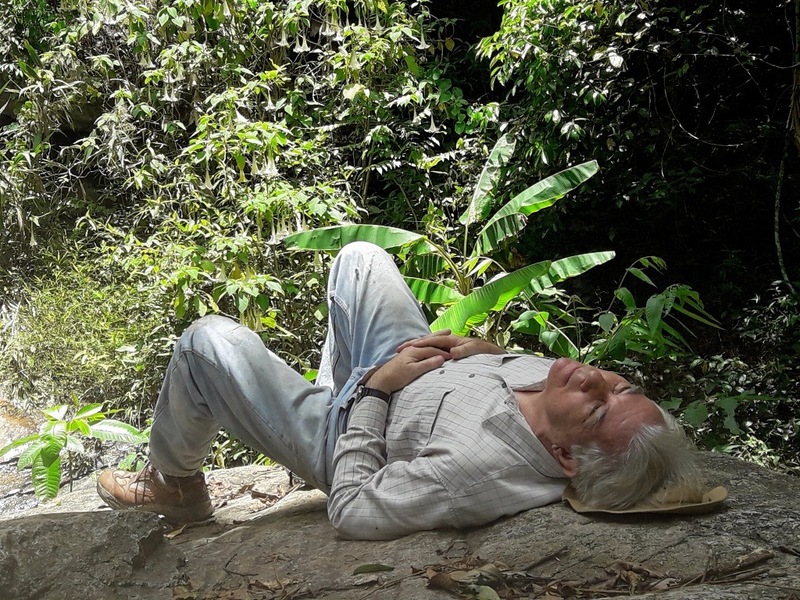 This photo was taken last Sunday by Lisa Levine — we were at the bottom of the Montathan series of waterfalls in the jungle very near Wat Pha Lad. Lisa showed me the hat photo first, then the one of what it’s like to be under the hat a day later, and if you click on the hat you can see the underside too — as I would like always to be seen, I admit, and of course know that I rarely am. You are unlikely to remember the little poem below, it’s so unassuming — I posted it four years ago on the thread called One for Sorrow, Two for Joy. Yet the poem is still very much on my mind, and has come to have a special place in La Croix Ma Fille. That’s the “Book of Poems & Relics” Julija Lebedeva has been illuminating, and which I’ve been talking quite a lot about recently. Indeed, it’s often the simplest and most naive poems from my past that come to speak to me most forcibly in the present, and this is certainly one of them. Another irony is that “Daedalus Brief” was one of the first poems I ever submitted to an editor for publication, and in Paris no less, so you’d expect it to be a lot more sophisticated than it is. But I knew nothing at all about anything at the time — I was only 51, after all, not a very big age for knowing much about what is simple and true. Because I was not yet the person under the hat on the rock but the boy in the air with the father’s brief folded up impatiently in his pocket. ……………………………………..Writing from the Shakespeare & Co. Fire Benefit. NOTE: “Daedalus Brief” is now placed just before one of the ‘crux’ poems in the new illuminated version of La Croix Ma Fille. You can read the poem that follows “Daedalus Brief” and an updated discussion of what lies behind both of them Here, and in particular in the Post Script at the end. Needless to say, I don’t call a spade a spade as I’m a poet. But if anybody reading this wants to suggest what he or she would rather call it what is more what it actually is, I’d be all ears. Because there are as many other words for such digging as there are angels dancing on the head of a pin — which is, of course, yet another ancient, outdated speculation that has become cutting-edge fodder for physicists in our times.